I follow celebrities and I enjoy on the gram because I’m nosey. I like to see the going ons in their lives and to see how they navigate their fame. I started following Majorie Harvey, wife of Steve Harvey years ago because of her fabulous style. She’s Glam-Ma goals and I love her globetrotting glamorous adventures. She spent Mother’s Day in her hometown of Memphis and I loved seeing her Mother’s reaction as she opened her gift. I thought nothing of seeing Marjorie and her family enjoy Memphis and it didn’t strike me as beneath her since it wasn’t in Paris, Saint Tropez or any of the other places around the world she frequents. We all have beginnings and home is a place most people go to feel centered and remember their childhoods. When I saw a picture of Marjorie chilling on the front stoop of her parent’s house with her family enjoying themselves behind her, I was touched because it was a sweet moment. Here was a grown woman, a proud grandmother known by so many for her style and her celebrity marriage looking so content and like a little girl in front of her childhood home. I liked the picture and kept scrolling while thoughts of my own childhood home filled my head. I was surprised to see the same image on The Shaderoom a few hours later with a classy clapback from Marjorie. There were other comments as well including, “If it wasn’t for Steve, you would still be on that stoop #favor.” The saddest part of all this was that these comments were from women. This got me thinking and I have to conclude that social media has taken away good old common sense and replaced it with online confidence that is not translated into real life situations. It is great that Marjorie and other celebrities with a following allow us to see their lives through pictures they post. 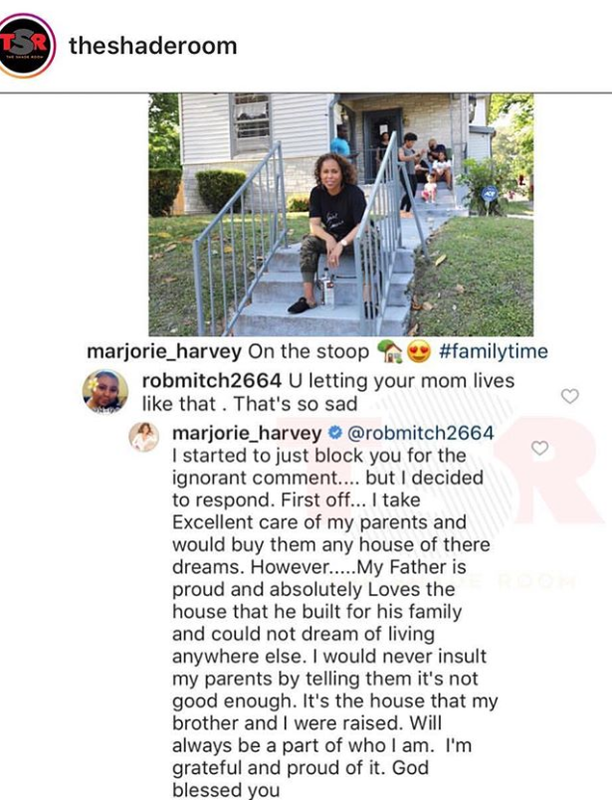 It is also a fact that none of these people with negative comments would have walked up to the stoop and told Marjorie all of these things to her face. Clapbacks from celebrities have become a fabric of celebrity news and it is the saddest thing to witness what they have to read from people. Assumptions are made about how much money they are spending or not spending, how they parent or don’t parent, where they live, how they dress, how they look, and everything else you can think of. Social media has given people such a false perception of reality and I fear that we will not know the long term effects until much later on. The BBC recently did a study on the effects of social media and found that 40% of the world’s population uses social media platforms for 2 hours a day on average. The study listed people being more stressed, lower moods, heightened anxiety, depression, less sleep, addiction, low self-esteem, strained relationships, and experiencing more envy and loneliness because of social media. That’s a whole lot and none of it is good. The intent of social media was to make us feel more connected and it worked for a while. It took a turn along the way and we are now bombarded with so much negativity from people. People will write two paragraph tirades in the form of a comment simply because their favorite celebrity puts sugar and butter on their grits. Those deeper in the hole will spend an entire day arguing back and forth with others about something else on the internet. What is all of this doing to our psyche? Time will tell and I fear it won’t be good. We have to take back our power and common sense when it comes to social media. We have to know that just because we develop an online persona that is more gully than our real life persona, it is still the internet and real life. Be accountable for what you say and know that it can have consequences. Don’t be the one fired from your job because of what you said online. Don’t say mean things online that you’d never say to the person if they were standing in front of you. Don’t make assumptions about what you don’t know and don’t even need to know. Live in real time and take a break from the internet sometimes, okkkuurrr? Do you think people start feeling hella loose with their comments to people on social media?